for the current Touareg so far. The third generation of the Modular Infotainment Matrix (MIB3) also has its debut alongside the new Passat. App Connect – the interface for integrating smartphone apps – therefore offers wireless integration of iPhone apps via Apple CarPlay™ for the first time at Volkswagen. If desired, the Passat can from now on be permanently online via MIB3, because the new Infotainment systems come with an integrated SIM card as standard. As well as improved navigation-related services with real-time information, this encompasses new technologies and offers, music streaming services, Internet radio, natural (online-based) voice control, seamless use of “Volkswagen We” online services and future cloud-based portable vehicle settings. It will also be possible to use the first smartphones as a “mobile key” for opening and starting the Passat. The drive range has also been enhanced. A perfect example of this is the Passat GTE – the plug-in hybrid model in the model line: It will have a considerably extended electric range. This is now up to approximately 55 km2) in the new WLTP cycle, corresponding to around 70 km2) according to the NEDC. At the same time, the combination of the electric motor and turbocharged engine (160 kW / 218 PS system power) means the Passat GTE provides the benefits of a comfortable, safe long-distance vehicle. 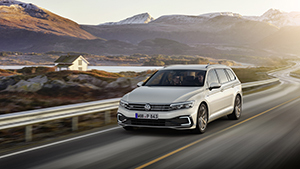 The Passat GTE already achieves the limits set out in the Euro 6d emission standard, which applies to new vehicles from 2021. All other TSI and TDI units fulfil the requirements of the Euro 6d-TEMP emission standard. In addition, every new Passat – whether a petrol or diesel engine – is equipped with a particulate filter.